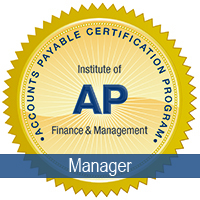 The Accounts Payable Manager Certification Program (APM) covers AP fundamentals, best practices, compliance and management, all of which are necessary to excel in the accounts payable field.This program includes the e-textbook, video recording of a full-day training, practice quiz and three attempts at the final exam. Enrollment expires one year from date of purchase. Estimated Learning Hours: 12 to 17. Member discounts of 10-20% apply automatically when a Member is logged in. If you are a Member and do not see a discount reflected when you add this product to your cart, please take these steps to access your benefit before purchase!